Now, there seem to be two ways of thinking on this. Some people are vegetarian and eat fish, others believe that fish falls under the meat category and think true vegetarians do not eat seafood. Me? I eat meat and really have no opinion either way, but unless people ask me not to, I may occasionally include a fish dish in my Meat-Free Mondays, simply because I have so many good ones and they are cheap and easy (which is the whole point of these recipes anyway). These salmon fritters are packed full of vegie goodnes, but please don't tell Isla because they are hands-down her favourite thing to eat. I make them for her probably once a fortnight, and Sparky and I eat them too. Usually will salad or steamed vegies. 1. Pop the salmon into a large bowl. Grate up the carrot, zucchini, onion and potatoes and add to the bowl. 2. Combine with the egg and a couple of tablespoons of plain flour. Season and mix well. 3. Take spoonfuls of the mixture and roll into balls. 4. 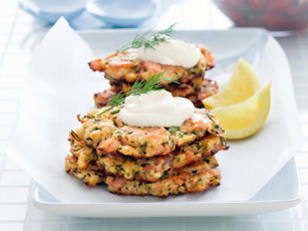 Heat a centimetre or two of vege oil in a frypan and pop the salmon fritters in in batches. Shallow-fry for a few minutes, then flip and cook through on the other side. Drain on paper towel. Seriously tasty and so yummy on a sandwich the next day too. Hopefully this didn't offend anyone! !